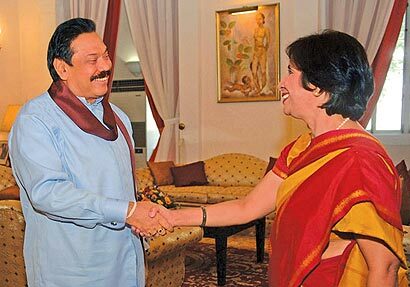 Indian Foreign Secretary Nirupama Rao who met President Mahinda Rajapaksa at Janadhipathi Mandiraya yesterday congratulated the President for his resounding victory at the recent Presidential Election. She observed that so much had taken place for the better in Sri Lanka since she was last here as High Commissioner. She said the President’s victory gave much cause for confidence and hope for bi-lateral relations between India and Sri Lanka in the future. The Indian Prime Minister looked forward to an early visit by President Rajapaksa to India, she said. Discussing current political developments in Sri Lanka, she said, the presence of more than 1,000 candidates for the forthcoming general election and the North and Eastern Provinces alone showed the enthusiasm of the people for the democratic process, and the change that had taken place with the restoration of peace. The Indian Foreign Secretary also participated at the opening of the Sri Lanka-India Centre of English Language Training (SLICELT) at Peradeniya yesterday. President Rajapaksa thanked India for the assistance given to the furtherance of his policy of providing English as a life skill to Sri Lankan youth. Rao also said the participation of more than 3,000 pilgrims from India at the recent feast at the St. Anthony Shrine in Kachchativu was a further indication of the good interaction between the Sri Lankan and Indian people. Commenting on the April 8 general election, President Rajapaksa said there was much enthusiasm by the people to participate in it, being the first nationwide election of representatives to Parliament after the restoration of peace. “He was looking forward to working with the many new faces and leaders who are expected to be elected, especially from the North and the East,”he added. The Indian Foreign Secretary was of the view that Sri Lanka had made considerable success on resettling IDPs in the North and the East, with the number now standing at less than 70,000, and noted that this issue had now gone away from the attention of the international community. She expressed India’s willingness to continue assisting Sri Lanka in the resettlement of the IDPs. Similarly, India was also keen to assist in the complete restoration of the railway line in the North, she said. Among other matters of mutual interest discussed were that of the problems faced by fisherman from both counties, the proposed coal powered power project in Trincomalee and the necessity for understanding between India and Sri Lanka on the protection of the environment and the eco-systems. President Rajapaksa later hosted Foreign Secretary Nirupama Rao to lunch at Janadhipathi Manidiraya. She was accompanied by Indian High Commissioner in Sri Lanka Ashok Kantha. President Rajapaksa was accompanied in the cordial discussions by Secretary to the President Lalith Weeratunga, Foreign Affairs Secretary Romesh Jayasinghe and Central Bank Governor Ajith Nivard Cabraal. WEL COME MADAM, YOU MEET GREAT PERSON IN SRILANKA. Wel Come Madam in the sametime give him Row idea to kill Mr.SF because both have good expirince otherwise meet mr gota. Ms. Rao is the most powerful foreign policy maker in the South East Asian region. India has a powerful team of foreign policy analysts supporting; the team includes Menon, Narayan, Col Hariharan and Col Nambiar. The dyanmism of Indian foreign policy was clearly demonstrated in March-May 2010 when the war in Sri Lanka was nearing an end and the General Elections in India was on and the “jokers’ in Tamil Nadu raising emotional issues of 80m tamil voters. India’s foreign policy was deterministically dyanamic with issues arising every day and every hour and responses provided instantaneously. Indian leaders including the foreign relations team and senior ministers (Shitambaram) cris-crossing the sub-continent and flying across to Colombo at the drop of a pin. There was Alok Prasad in Colombo providing direct moral and diplomatic support. Fanatstic! Someone should turn this event into a movie. Glad to see Ms Rao carrying the baton now. This strong relationship beteween the Congress led India and the Rajapaksa led Sri Lanka will ensure a monolothic society in Sri Lanka. The aid being given by India should be used to develop the Northern and Eastern Provinces specially the Vanni and Mullaitheevu Districts so that the landless peasants for the Southern provinces can be settled expeditiously to cultivate virgin and rich lands and feed the population. All excess lands and other infrastructure must be developed so that Indian Entrepreneurs could transfer their technological capabilities and reap dividends while providing Sri Lankans with jobs. There is one thorny issue that needs to be sorted out before all this could happen. The Registrar of Births and Deaths of the Vanni District should forward Velupillai Prabakaran’s death certificate to India so that the High Court file could be closed along with that chapter of history. May God bless our leaders and our lands.